Home Management 101 – What does a Smoke Detector do? It’s true that most homes have smoke detectors, but people forget that they’re generally not monitored: what happens when that smoke detector starts to wail, and you’re not there to hear it? That’s why homeowners are increasingly turning to monitored fire protection. A failing power strip caused the fire that damaged a second-floor room at a Widgeon Way home Monday night, fire officials said Tuesday. The fire was first reported at 8:57 p.m., according to Deputy Fire Marshall McDonald.. Responding fire crews were able to quickly get the blaze under control, he said. There were no injuries in the blaze, said McDonald, who added that he didn’t know how many people lived in the house. Along with fire damage in the second-floor room, there was also some water damage on the first floor, he said. McDonald pointed out that the house is outfitted with an automatic smoke detection alarm, which quickly sent an alert to a monitoring station that alerted the Fire Department. Chances are these homeowners were already receiving the additional discount on their insurance and with Burns & McBride there’s no extra monthly charge for adding fire monitoring. Our Smart, Safe Home system can detect a lot more than intrusion: fire, carbon monoxide, water, low temperature, and other conditions may all be transmitted to the monitoring center ( over a cellular link), and today’s systems can also alert you of these events: you’re only a text or an email away. At Burns & McBride Home Comfort, we want you to be safe – and in the know. 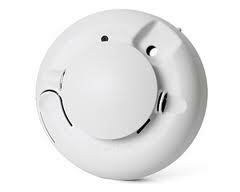 The Burns & McBride smoke alarm detects drastic increases in heat, as well as smoke. So even if your home experiences a wall fire, the alarm will trigger. Once the alarm has been tripped, it will alert the central monitoring station who will contact the correct personnel in as few as 17 seconds.